The Natural Gas Vehicle Association (NGVA Europe) is a European association that promotes the use of natural and renewable gas as transport fuel. Founded in 2008, its 135 members from 31 countries include companies and national associations from across the entire gas and vehicle manufacturing chain. NGVA Europe welcomes the publication of the EU Commission’s Proposal for setting emission performance standards for new passenger cars and light-duty commercial vehicles. Furthermore, NGVA Europe would like to highlight the importance of introducing a more comprehensive approach for assessing the environmental benefits from the mobility solutions, especially considering the role that renewable energy can play in decarbonising transport emissions. Under a medium-long-term perspective, the Well-to-Wheel approach can guarantee a fair and complete evaluation of the decarbonisation effect among different solutions, translating the need to maintain technology neutrality. Technology neutrality is mandatory in the next decades in order to provide to the transport sector as much as possible solutions to achieve the decarbonization target and to tackle air quality issues. While electrification will progressively penetrate the market, other solutions, already available today, have to contribute to that accelerating the reverse of trend of the CO2 emissions from this sector. Current tailpipe approach for type-approval homologation remains unchanged to provide the information about fuel consumption/vehicle efficiency. 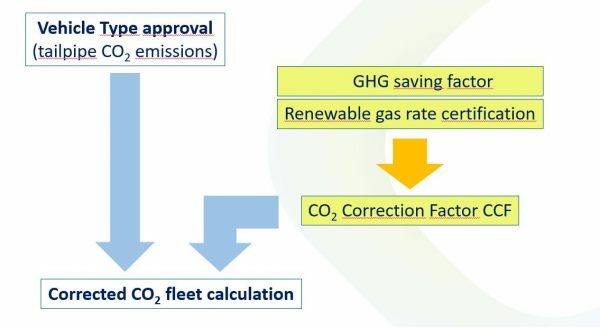 This measure will create a real market demand from renewable gas (but the same scheme could also apply to other advanced sustainable biofuels), with the consequence to spread the CO2 reduction effect not only on the new registered vehicles but also levering on the existing fleet that, anyway, will be on the road in the next years and will be responsible of most of the CO2 emissions from the sector.